jettero: This is not the first time this has come up for me. My teacher tells me that 2 is better at A or B. My idea for exploiting it, perhaps later on, is to attach to the 2-stone and cross cut. Is there a known method to cut up the lantern procession? 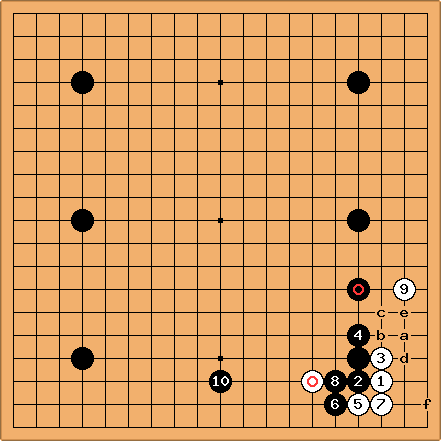 Is it simply a good move? Why is A better? Perhaps it's because black can't make the horses face at C from 2? (additionally) I appreciate tderz points below and understand them. 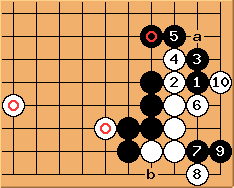 They are excellent points that I'm likely to use in my next H6 game as black. But my questions were about the play at 2 vs. A in my diagram and were not intended as a global strategy questions. It turns out, there is actually a page on cutting lantern procession (that I'm embarassed to say: I myself added); but I'm going to leave the question as is, since I'm still curious if cross cutting (later) is a bad plan. ''1) This is not the first time this has come up for me. 2) My teacher tells me that 2 is better at A or B. 3) My idea for exploiting it, perhaps later on, is to attach to the 2-stone and cross cut. 4) Is there a known method to cut up the latern procession? 5) Is it simply a good move? 6) Why is A better? 2) I find here (d in your diagram) even more active. Black awaits any white moves a to d or elsewhere. is an extension of the left hoshi and attcks . 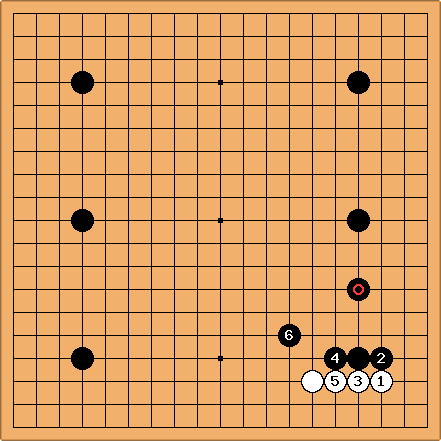 After gyaku kakari, Black can move out (e.g. 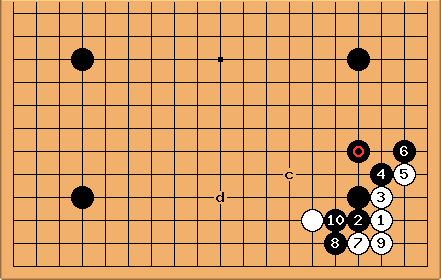 5-5 at k) and split White in two. 3) For white the global, strategic ideas could come first, I am sure you mean that (white f to i, or again elsewhere). With 6 ranks strength difference, white can do tactically what she wants and always get a locally acceptable result. However, globally this might not be the best available. 4) I do not understand this .. ..
Now that you added the link cutting lantern procession I do understand your question. I am convinced by my reply to your question 3. A speedy opening with global perspective is more important in high handicap games, in my opinion. See it as large moyo to be reduced from White's perspective. You simply don't have time to fuss about small issues (whether there is a crosscut or not). 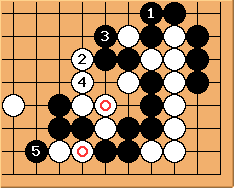 White should try to distribute some stones on the board (I think of Iwamoto's "machine gun Go"). This only works if White takes local sente several times. My advice for Black is "don't let White take local sente", put on pressure, pincer/attack/split. That's the good attitude. With the necessary (black) mistakes, errors, oversights, slight or grave miscalculations or White's bluff poker (sometimes) this will not always work. Personally, I would not attach much importance to the question a or b or e or in dia and rather play in dia. (ok, here I repeat myself). 5) You are referring to in ? positive: it connects somewhat the right, but negative: it let's White more leeway on the bottom. 6) Perhaps just more often played and not necessarily better. 7) This is for sure not the reason (and made me answering your questions), cf. my reply to your 2nd question. Was the idea of the horse face to build a moyo? 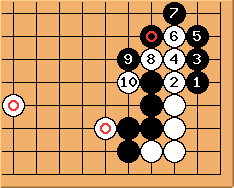 I got once the advice from Feng Yun (in a different Sanrensei Fuseki): "Don't build the moyo to early". I pass on this comment (if that was your idea). I find in  the easiest and most consequent choice to keep the initiative. Dieter: Conventional wisdom states that is wishy-washy and a (or b) leaves less options for White. But we are here to question conventional wisdom. Clearly, a move that adheres to the principles of connection, that is played on the fourth line and that is the first move by Black, cannot be a bad move at all. If worse than a, it should only be slightly worse. If we first look at the 3-3 point invasion, White ends in sente. 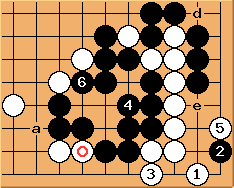 With the marked stone in place, Black can play at . It makes sense to more firmly defend the corner that is approached than the stone at the side. In handicap play, leaving more options to White is generally worse. In even play too, I guess, but I have seen it as some kind of strategy. In any case, if I were to play White and you play the two moint jump, I will not fool myself into thinking I am catching up bigtime. 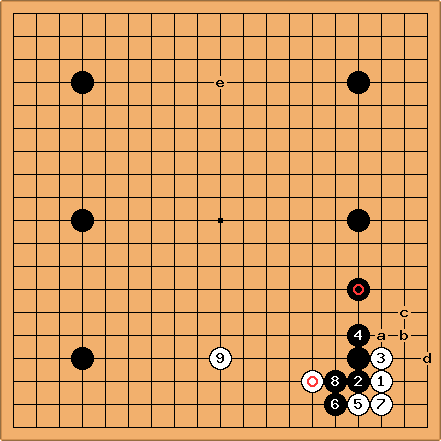 Velobici: Is (above), following the White invasion of , the correct direction of play? 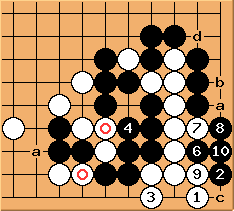 While the position of the marked Black stone is not ideal, the mid-side star point is ideally placed. 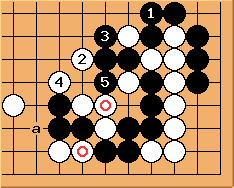 The extra stone may help Black control the side given the strength difference of 6 handicap stones. Bob McGuigan: I think Black is overconcentrated on the right side. 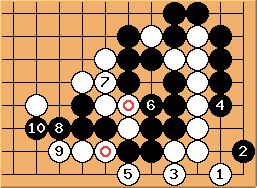 Granted this might not be serious given the six-stone handicap but still we should try to play the best moves all the time. 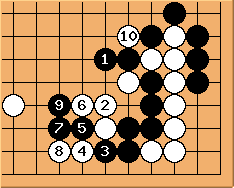 One way to think about this is that Black would not play the stone if the , , wall were already there. Another way to think about it is that the starpoint stone in the middle of the right side is a good extension from the black wall so having the stone there is using two stones to do the work of one, i.e. inefficient. Bill: Bob is right. 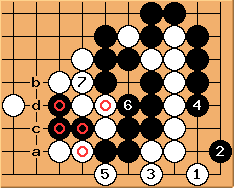 Black should play to keep White separated. Because is so far away, White can play . Then is honte, I believe. This is OK for Black, I think. Velobici: The result immediately above is very different from that in the first digram (see Dieter: Conventional wisdom above). 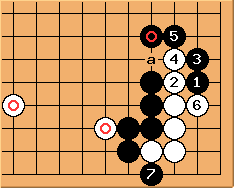 Here Black is able to play providing a pincer to ...something that was missing above. Even so, this diagram does show a problem with . Velobici: If is on the bottom, meaning that White does not play again in the lower right corner before Black, then after Black a, White is dead in the corner, no? zinger: I don't think so. 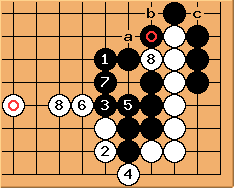 If elsewhere, black a, then b-c-d, leaving e and f as miai to live. Notochord: How about a-b-e, then? tderz: dia. : My main line would be taking local sente Ba_, Wb, Bc_, Wd, and going for the globally big point Be (sanrensei). dia. Black keeps it simple. 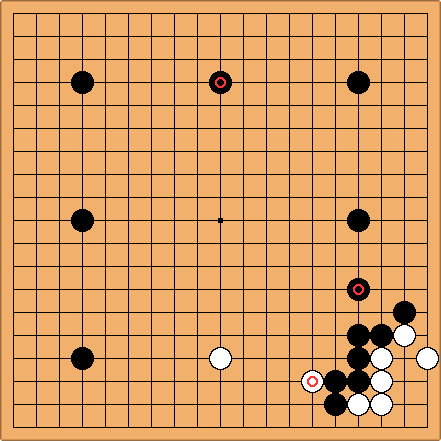 Conclusion: White lives - keep it that way and take the great points! dia. : tderz: White lives after Ba, Wb. See Zinger's  above. dia. : Black is stubborn. Because of  I would not recommend this. dia. 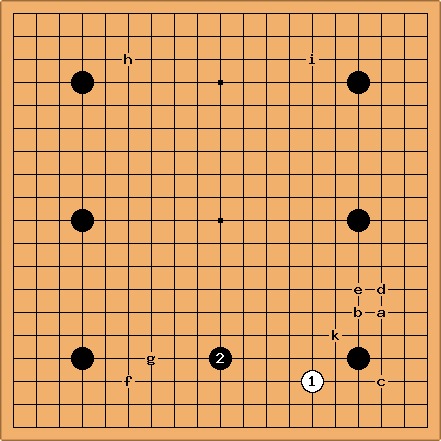 : If , White lives, is out and Black has cutting points at a, b and c. dia. : tderz: If white tries more with ... she collapses. - - - anyway and Black gained liberties. dia. : White collapsed left and right. made empty triangle. dia. : If White captures with a, she dies in the corner. dia. : If White wants to live, should simply capture. Before you laugh, check out dia  first. dia. 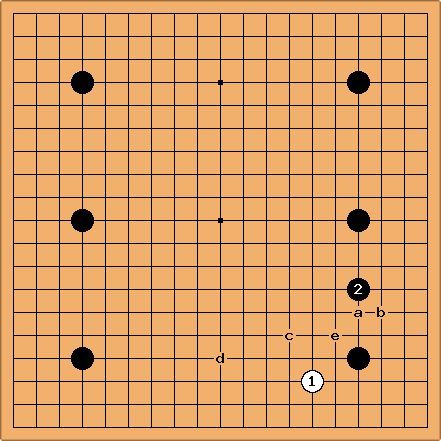 : For the reason given in dia , White better connects at here (cf. dia ). dia.: ? Black's shape of is very delicate. ? (cf. 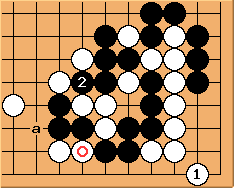 dia ) Ba or b fail due to c and d.
Black better controls/takes with here ^^. unkx80: It should be pointed out that reduces White into a standard L-group dead shape. 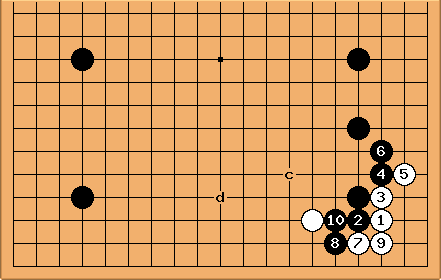 What happens when White subsequently plays at a, I do not exactly know. tderz: thx, I should pactice more.